I blogged last week about the new Beauty Boxes Make Up Brushes (you can read my review of the Kabuki Brush here if you missed it). Beauty Boxes has just launched a new range of clear cosmetic/ travel pouches available in four different sizes. The Louisville is the smallest of the pouches and provides a stylish alternative to the clear plastic bags at airport security. 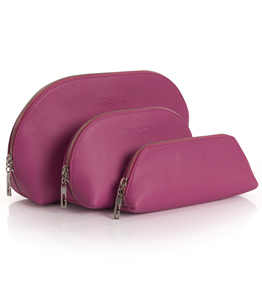 Light and easy to pack, the larger Granville and Belleville pouches can hold bottles, jars and tubes, such as sun cream and the Montville pouch has a roomy main section for cosmetics and zipped side pocket for storing hair accessories. The new Powder Room range has different sized make-up pouches in either green, pink, lilac, yellow, mauve or black, all with a polka dot lining. The bags are priced between £4.45 and £8.45 for the clear cosmetic travel pouches and £11.45 to £15.46 for the Powder Room Range they are available online at www.beauty-boxes.com very handy for travelling and holidays! A beauty box is something every woman should have. even if is small or not this accessory is required for a respectable lady. Nice blog on Cosmetic Bags.